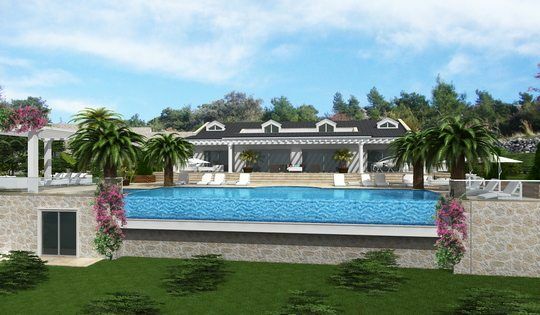 This Turkish property for sale is a beautiful 5 bedroom villa located on one of the few frontline sea facing plots available in the pretty traditional farming village of Faralya, which will appeal to those who cherish luxury, peace and tranquility. Ground Floor: On the ground floor you will find the large open plan lounge and dining area through patio doors and windows overlooking the sea and giving access to an extremely large wrap around dining balcony which leads onto the feature infinity pool. There are 2 suite style bedrooms, each with a bath/shower room and a W/C on this floor as well. On the first floor there are two or three more bedrooms, each with en-suite facilities and a dressing room. This is a property ideal for investment or as a luxury retreat home and will rise considerably in value due to the fact there is little land in the region offering fabulous sea views.